Phillips gets one "in the guts"
The siren sounds to end the game and the Bombers have run out big 66 point winners over the Giants who battled hard all night. The Bombers will go down in history as the first team to win at Skoda Stadium. BEHIND BOMBERSLonergan has a long range shot on goal, but is offline. GOAL GIANTSScully with a quick handball over to McDonald who kicks for goal, McVeigh is after him, but fails to get him on the way through. 'The Chad' Cornes is bemused over a free kick that the umpire gave against him, as he gives out a laugh. 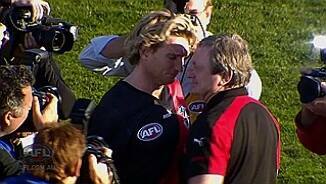 There could be rumblings about during the week of a new premiership favourite in town and that will be the Bombers. GOAL BOMBERSZaharakis puts some more hurt onto the scoreboard for the Giants, extending their lead to 61 points. BEHIND BOMBERSRyder attempts a mark on the goal line, but only manages a point, as it goes over the goal line. The Bombers have the Demons next week and then the Swans before the bye, whilst the Giants will face the Cats and will then take their mid season break. BEHIND BOMBERSGiles punches it through for a rushed behind for the Bombers. The Bombers will need to look at taking off some of their big guns, as wouldn't want to risk injury here, with the game done and dusted. GOAL GIANTSCameron marks 40m from goal directly in front, he kicks his third goal of the night, as he runs off the ground as part of the rotation process. The great thing about the Giants is that they never give up no matter how bad their position in the game is. GOAL BOMBERSWatson picks, kicks and delivers a goal for the Bombers, who are out to a 59 point lead. GOAL BOMBERSBellchambers marks 45m from goal directly in front, he kicks truly for his third goal of the night. There is a bit of a lull in the game at the moment, as both teams are really just playing it out for time. Essendon will finish the night on top of the ladder, eagerly awaiting the result of the West Coast game to see if they will be able to keep the position, or just keep it warm for the Eagles. GOAL BOMBERSDavey gathers possession inside the goal square, plants it onto the boot for his third goal of the night. GOAL BOMBERSThe ball spills to Ryder at the back of the pack, who runs into an open goal, the Bombers are back out to a 51 point lead. Injuries are starting to creep into the Bombers players, after the sub being made already. They would not want any more personnel to go down tonight. GOAL GIANTSGiles marks inside 50, he goes for goal and he splits the middle. It appears that Crameri's groin injury is getting worse as the game wears on, but news coming through is that Dyson also has a groin injury and cannot run. SUBSTITUTION BOMBERSSlattery, the late emergency in place of Hardingham, has been activated in place of Dyson. SUBSTITUTION GIANTSKennedy has been subbed off and Darley has been activated into the game. We are back for the final term, as the umpire bounces the ball in the middle of the ground. The Bombers have built on their lead, to be 51 points in front of the Giants at the final break. BEHIND BOMBERSAfter having a quiet night, Stanton bobs up with a shot on goal but can only manage a minor score. GOAL GIANTSCameron marks the ball 35m out on the boundary, he slots it through for his second goal of the night. GOAL BOMBERSMelksham runs onto the ball, looks up at goal and drills it. The Bombers are forecasting a three point margin. It appears that the Giants have done all they can against the Bombers, with the red and the black taking complete control in the third term. BEHIND BOMBERSDavey pounces onto the loose ball, looks up at goal and kicks it across the face of goal. GOAL BOMBERSMonfries lets it rip from 45m and he kicks an easy looking goal. Bombers extend their lead to 49 points. BEHIND BOMBERSThe Bombers are the beneficiary of another rushed behind. Trouble in paradise for the Bombers, with news that Crameri is struggling with a groin injury starting to filter through. The Bombers have skipped away to a 42 point lead, the biggest lead in the game so far. GOAL BOMBERSCrameri gathers the ball from 60m out, there is nobody between him and the goal as he strolls through and kicks the goal. BEHIND BOMBERSThe ball comes off hands and over the goal line for a rushed behind. GOAL BOMBERSMonfries is awarded a free kick for a high tackle, he takes the kick and slots it through the middle. BEHIND GIANTSThe ball is punched through for a rushed behind for the Giants. If the Giants can outscore the Bombers by another two unanswered goals, the game will be in the balance. GOAL GIANTSFinally, the Giants get some reward for their hard work, with Cameron marking inside 50 and slotting through a much needed goal. This games is a lot more closer than the scoreboard shows, with the Giants having 12 scoring shots to the Bombers 13. BEHIND BOMBERSZaharakis is on the run, he looks up at goal and has a shot but misses. 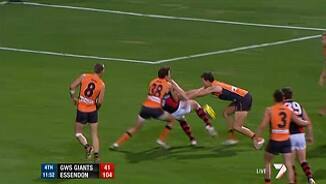 BEHIND GIANTSThe Bombers return the favour to the Giants with a rushed behind of their own. Once again the Giants slow the Bombers down, but are unable to put the good work onto the scoreboard. BEHIND BOMBERSDavey gathers the loose ball, takes the shot at goal and misses. The Giants will need to kick a goal early in the term to keep them in touch with the Bombers. GOAL BOMBERSBellchambers marks 40m from goal directly in front, he takes the kick on goal and slams it through. We are back for the second half, as the Bombers get first use of the ball. The siren sounds for half time and the Bombers go into the main break with a 28 point lead over the highly competitive Giants. GOAL GIANTSTreloar has worked hard all night, as he is gifted the ball at the edge of the goal square, he runs in and kicks the goal. The Bombers are working their big men in Ryder and Bellchambers in tandem quiet well. GOAL BOMBERSColyer marks 45m from goal on a slight angle, he takes the shot at goal and extends the Bombers lead to 34 points. After the Giants dominated the general play with not much reward on the scoreboard, the Bombers are starting to get on top once again. GOAL BOMBERSCrameri marks inside 50 near the boundary, he takes the difficult shot at goal and kicks a great goal. Bellchambers gathers the loose ball, as he has a shot at goal, but is bumped off the ball, sending the kick out on the full. The Bombers are only leading the Giants by 22 points, so the lead is still very gettable, if the Giants are good enough. GOAL GIANTSShiel runs onto the ball, gathers possession, runs into the open goal and kicks the Giants first goal at Skoda Stadium. BEHIND GIANTSShiel takes another shot on goal and once again he is inaccurate. BEHIND GIANTSSmith kicks around his body for goal and it goes through the wrong side of the goal post. The Bombers are trying to find better positioning around the ground, in order to set up their next tilt at goal. 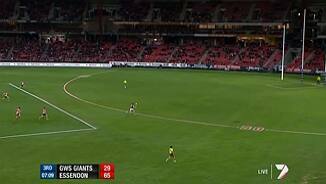 To say the obvious, the Giants desperately need the next goal, to stop the run of the Bombers. GOAL BOMBERSA beautiful kick by Watson to the lead of Crameri, 20m from goal directly in front, his kick is good. It appears that the Bombers are starting to get going leaving the Giants behind in their tracks. GOAL BOMBERSDavey marks 45m from goal, he goes for goal and gives it a good hoist, kicking a goal, to bring the Bombers to a 24 point lead. The Giants are still waiting to kick their first goal of the match. GOAL BOMBERSHurley marks inside 50, he decides to go for the set shot at goal and makes good work of it, kicking a goal. BEHIND GIANTSFrom the kick in, the ball ends up with Cameron, who sizes up the sticks but is offline. BEHIND GIANTSThe ball comes off hands for a rushed behind. We are back for the second term, as the Giants get first use of the ball. The siren sounds to end the quarter and surprisingly the Bombers only lead by 14 points, with the GWS having more scoring shots than Essendon. BEHIND GIANTSSmith marks just inside 50, takes the set shot on goal and pulls it to the left. BEHIND GIANTSAdams takes a running shot on goal and it bounces through the wrong side of goal. The Giants have only had four goalless quarters, will this be number five? GOAL BOMBERSBellchambers marks inside 50, he takes the set shot and splits the middle. Essendon lead by 16 points. BEHIND GIANTSShiel marks just inside 50, he takes a kick for goal and misses. BEHIND GIANTSTownsend marks 45m from goal directly in front, he has a shot on goal and pulls it away to the right. The Giants tackling game is getting better and better as the game wears on. 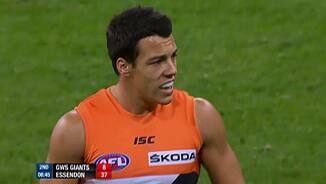 It has been a good few minutes for the Giants, who have been able to restrict the run and carry of the Bombers. The surface of the ground is starting to be affected by dew, making conditions a little slippery. BEHIND BOMBERSBellchambers takes a pot shot at goal and is offline. BEHIND GIANTSMcDonald is taken high 40m from goal directly in front, he has a shot on goal and pushes it away to the right. This game was touted as Master (Kevin Sheedy) Vs Apprentice (James Hird), with the apprentice likely to score points over his master. The Bombers are dominating possession in their forward line. The Giants will need a goal early or will be in danger of being run over by the Bombers, as they did to the Gold Coast when they first met last year. GOAL BOMBERSDavey grabs the ball front and centre at the edge of the goal square and kicks an good running goal. The Bombers are highly fancied to continue their fairytale start to the season. GOAL BOMBERSRyder takes an easy mark against Cornes 40m out, there is a scuffle behind play, 50m penalty. Ryder kicks the first goal of the match. The subs are Slattery for the Bombers and Darley for the Giants. The ball is bounced and we are under way. Welcome to Skoda Stadium for the first time, for the match between the Greater Western Sydney Giants and Essendon. One late change for GWS with Folau out and replaced by Townsend, Bombers as named. 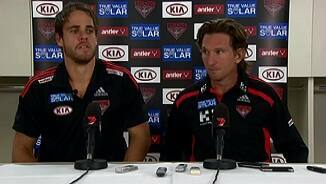 ESSENDON coach James Hird has claimed bragging rights in his first battle with long-time mentor Kevin Sheedy, leading the Bombers to a comfortable 66-point victory over Greater Western Sydney on Saturday night. The Giants showed off their sparkling new Skoda Stadium and again demonstrated their competitiveness and promise for the future, but the Bombers took off in the third term en route to a 18.11 (119) to 7.11 (53) win. It improves Essendon to 8-1, its best start to a season since 2001, while GWS remains on one win during its first year in the AFL. Stewart Crameri, Alwyn Davey and Tom Bellchambers kicked three goals apiece for the visitors, while David Zaharakis, Jobe Watson and Nathan Lovett-Murray found plenty of the football. 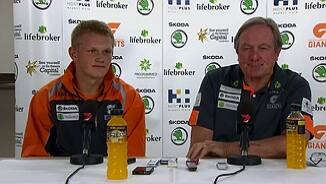 Following the game, Hird said he was surprised how competitive the Giants were. "We'd planned for them being good, but even planning for it, they were better than we thought they were around the contest," he said. "We certainly didn't think that we played the way we wanted to in the first half [but] I'm satisfied that we went out and we won the game." Adam Treloar, Dom Tyson, Devon Smith and Dylan Shiel held their own for the Giants, with Jeremy Cameron kicking three goals in front of a modest crowd of 11,887. Speaking on radio before the match, injured Giant Setanta O'hAilpin said the club was desperate to put in a committed effort for Sheedy, coaching for the first time against the side he led to four flags over 27 years. "The boys want to put on a great show for him," O'hAilpin said. "He deserves that. This is our mini Grand Final." And the young side responded early, with only some wayward goalkicking preventing it from truly challenging the high-flying Bombers in the first half. But 10 goals to five after the main break told a telling tale. It took less than one minute for the first goal to come at the AFL's newest stadium, via Essendon's Paddy Ryder. Davey then had the visitors' second on the board three minutes later in an ominous start, but the Giants responded impressively, pinning the ball in their forward half for much of the next 20 minutes. GWS had four shots on goal, but all were from outside 50m and all sailed wide before Smith's late miss from 40m on an angle gave them five behinds for the first quarter. The Giants were queuing up to make history, but their excitement appeared to get the better of them as they continued to spray a succession of goal-scoring opportunities as the crowd's impatience increased. The moment finally came at the 19-minute mark, with Shiel swooping on a loose ball and running into an open goal to release the intense pressure building up among the home fans. At half-time GWS had managed 11 scoring shots to nine, but only returned 2.9 to Essendon's impressive 8.1. Kevin Sheedy said: "I thought that for a first half, if we had had some goal power and kicked accurately … we worked really hard to get back into the game. "We fought for contested balls and we were pretty good. Obviously the score doesn’t show it that way because they kicked very, very straight. "But our players in the end need to be better at goal scoring." In the end it was little surprise the floodgates opened after the main break as the Bombers flexed their muscles ... but the Giants received some more valuable AFL education.